A concrete block paved driveway can add instant kerb appeal to your home, or why not use it to create a unique garden patio? With many colours and styles to choose from we have something to suit every taste. Concrete Paving Slabs Create decorative patios, pathways and functional areas around your home. Concrete Paving Slabs can be used to create both decorative and functional areas around your home for an instant extension of your indoor living space, outdoors. Natural Stone Slabs Create a spectacular outdoor space that will look great for years to come. Natural Stone Slabs offer a stunning alternative to concrete paving for a truly unique and timeless look. Decorative Aggregates Attractive, hardwearing gravels and chippings to complement your garden design. Kerbs and Edgings Decorative and functional accessories to complete your landscaping design. Flash Sale Click here for amazing deals across our paving and accessories ranges. Grab the best deals on concrete block paving, concrete paving slabs, natural stone paving and accessories in our flash sales and special offers. We aim to give you fantastic discounts on a wide range of garden and driveway products - including discontinued lines. 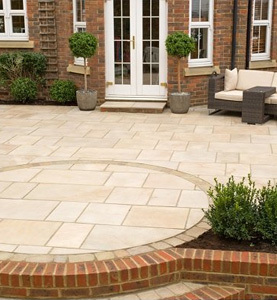 At clearancepaving.co.uk you can find cheap Concrete Block Paving, Concrete Paving Slabs, Natural Stone Paving Slabs and other landscaping materials such as Decorative Aggregates, Kerbs and Edgings delivered direct to your door. Whatever your landscaping project we’ll have a deal for you. Combining some of the cheapest prices around, regular special offers and flash sales, easy online ordering and payment, quick direct delivery and responsive customer service, we are confident that you won’t find a better service anywhere else. We hope you find what you’re looking for, but if you need any assistance regarding our cheap paving and aggregate products please contact our helpful team on 0345 60 42 08.